Greta Gerwig has been a force in filmmaking for a number of years now as both an actor and writer. With this week’s Lady Bird she expands into directing as she tells the story of a young woman in 2002 trying to figure out who she is and be true to that. 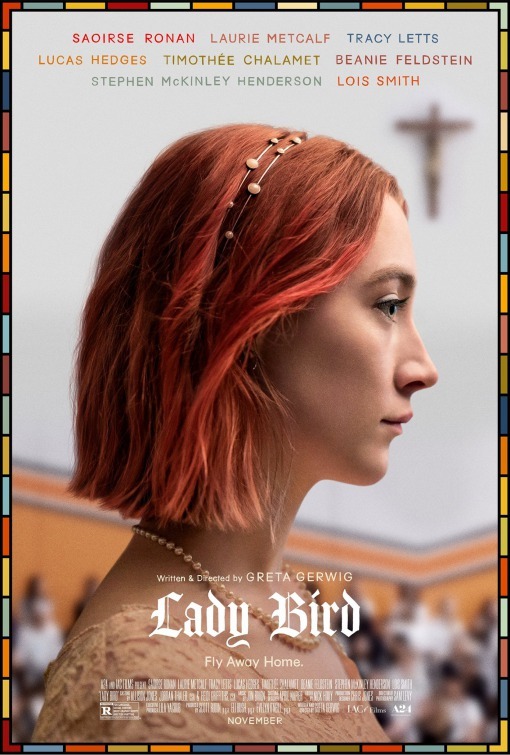 Satires Ronan stars as Christine “Lady Bird” McPherson. She and her mother Marion (Laurie Metcalf) are too alike to ever really agree on anything. Christine is going through the usual uncertainty about identity, maturity and religion that are common to young adulthood as she butts heads with her mom, deals with her father’s job loss and more. The first poster doesn’t feature any of the cast, at least not their pictures. 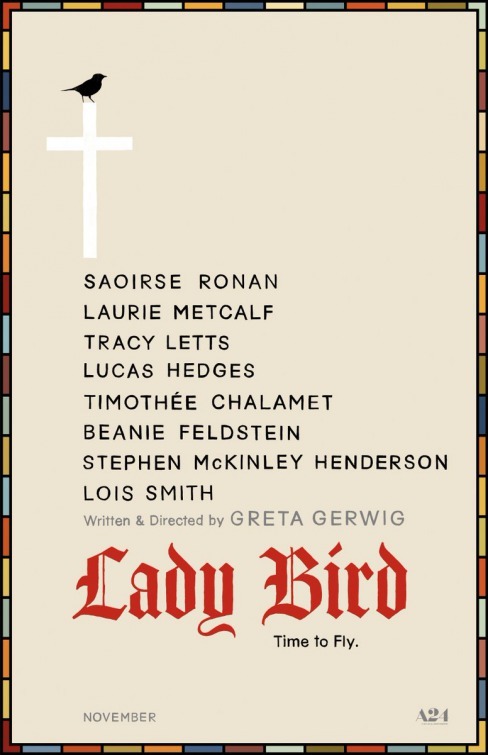 All their names are here to show off the strength of the ensemble, those names appearing between a cross with a bird perched on the top and the title treatment that’s shown in a very stylized font. Those elements – the title, the cross and the stained-glass border around the whole thing convey that religion will likely play a big role in the story. The second poster puts Ronan in profile. The same sort of emphasis on religion is made both through the continued use of the stained glass border seen on the first poster and the cross that hangs on the wall in the background of the photo. The mother/daughter dynamic is what opens the first trailer, which shows just how much Lady Bird wants to accomplish and how she’s trying to create a unique identity for herself. She’s rebelling against the ideas her mom has for her and clashes between the two is a constant theme. They love each other and can’t stand each other, which makes the usual drama of growing up just a bit more difficult. Well that’s just fantastic. It looks like Gerwig has crafted a strong story of family dynamics that has a sensitive touch and characters you want to succeed who are brought to life with a couple great performances. The official website opens with a bit of video that, when clicked, plays the trailer, which is absolutely worth watching again. That’s actually about it on the site with the exception of links to the movie’s Facebook, Instagram and Twitter profiles. A24’s page about the film has a synopsis and the theatrical poster, but even with that there’s not a whole lot going on online. Nothing that I’ve come across, though there may have been some targeted advertising done in New York and L.A. in advance of the movie releasing there. The first real news of the movie came when A24 picked it up and announced intentions to give it an awards season release. The movie was announced as one of those that would screen at the Toronto International Film Festival as well as the New York Film Festival and Telluride. A little while later EW shared the first photos from the film. Those Telluride screenings created a lot of positive buzz for just about everyone involved, from Gerwig to Metcalf to Ronan, all of whom were praised for their contributions and/or performances. While there Gerwig talked about not only stepping behind the camera for the first time but the process of casting just the right people to tell a story that has more than a few personal connections. She also joked about the backstory of Dave Matthews Band’s inclusion in the movie. The positive buzz kept growing in the wake of its NYFF screenings, which were very successful. Gerwig was given the ability to program a series of films at NYC’s Quad Cinema that made up her inspiration for this story and more. She was also the subject of another in-depth profile that covered not only her career to date and the controversy and buzz that’s followed her over the years but also her personal beliefs, her confidence in taking on the role of director and much more. It’s obvious that A24 has let Gerwig take the lead in the publicity and press aspect of the campaign, likely because she’s almost completely absent from the official marketing elements. That’s a strong decision because of her charm and respect among filmgoers who have found many of her performances to be among the best of whatever year they were released. This is a big moment in her career and so she’s been given the spotlight. As for the movie itself, it looks funny and heartwarming and insightful, all traits it’s easy to associate with Gerwig. Ronan seems to be giving a strong and grounded performance as a young woman who doesn’t know when to push away from her family and when to pull them closer and, from a general audience point of view, provides a strong reason to see the film. Metcalf can’t go unmentioned either as the mother who just wants to help her daughter succeed. If this can find the right people it’s easy to see this becoming a crossover mainstream word-of-mouth hit.